Born in 1207 in the town of Balkh in Khurasan (near Mazar-I-Sharif in contemporary Afghanistan), Jalal al-Din Rumi was the son of a brilliant Islamic scholar. At the age of 12, fleeing the Mongol invasion, he and his family went first to Makkah and then settled in the town of Rum in 1228. Rumi was initiated into Sufism by Burhan al-Din, a former pupil of his father's, under whose tutelage he progressed through the various teachings of the Sufi tradition. After his father's death in 1231, Rumi studied in Aleppo and Damascus and, returning to Konya in 1240, became a Sufi teacher himself. Within a few years a group of disciples gathered around him, due to his great eloquence, theological knowledge and engaging personality. In 1244 a strange event occurred that was to profoundly change Rumi's life and give rise to the extraordinary outpouring of poetry for which he is famous today. A wandering mystic known as Shams al-Din of Tabriz came to Konya and began to exert a powerful influence on Rumi. For Rumi, the holy man represented the perfect and complete man, the true image of the 'Divine Beloved', which he had long been seeking. Despite his own position as a teacher (a Sufi sheikh), Rumi became utterly devoted to Shams al-Din, ignored his own disciples and departed from scholarly studies. Jealous of his influence on their master, a group of Rumi's own students twice drove the dervish away and finally murdered him in 1247. Overwhelmed by the loss of Shams al-Din, Rumi withdrew from the world to mourn and meditate. During this time he began to manifest an ecstatic love of god that was expressed through sublimely beautiful poetry, listening to devotional music and trance dancing. Over the next twenty-five years, Rumi's literary output was truly phenomenal. In addition to the Mathnawi, which consists of six books or nearly 25,000 rhyming couplets, he composed some 2500 mystical odes and 1600 quatrains. Virtually all of the Mathnawi was dictated to his disciple Husam al-Din in the fifteen years before Rumi's death. Mevlana (meaning 'Our Guide') would recite the verses whenever and wherever they came to him - meditating, dancing, singing, walking, eating, by day or night - and Husam al-Din would record them. Writing of Rumi and his poetry, Malise Ruthven (Islam in the World) says, "No doubt the Mathnawi's emotional intensity derives in part from the poet's own vulnerable personality: his longing for love is sublimated into a kind of cosmic yearning. The Love Object, though divine and therefore unknowable, yields a very human kind of love. In the Quran a remote and inaccessible deity addresses man through the mouth of his Prophet. In the Mathnawi it is the voice of the human soul, bewailing its earthly exile, which cries out, seeking reunification with its creator." Rumi is also well known for the Sufi brotherhood he established with its distinctive whirling and circling dance, known as Sema and practiced by the Dervishes. The Sema ceremony, in seven parts, represents the mystical journey of an individual on their ascent through mind and love to union with the divine. Mirroring the revolving nature of existence and all living things, the Sufi dervish turns toward the truth, grows through love, abandons ego, and embraces perfection. Then he returns from this spiritual journey as one who has reached perfection in order to be of love and service to the entire creation. Dressed in long white gowns (the ego's burial shroud) and wearing high, cone-shaped hats (the ego's tombstone), the dervish dances for hours at a time. With arms held high, the right hand lifted upward to receive blessings and energy from heaven, the left hand turned downward to bestow these blessing on the earth, and the body spinning from right to left, the dervish revolves around the heart and embraces all of creation with love. The dervishes form a circle, each turning in harmony with the rhythm of the accompanying music as the circle itself moves around, slowly picking up speed and intensity until all collapse in a sort of spiritual exaltation. Rumi passed away on the evening of December 17, 1273, a time traditionally known as his 'wedding night,' for he was now completely united with god. In the centuries following Rumi's death, many hundreds of dervish lodges were established throughout the Ottoman domains in Turkey, Syria and Egypt, and several Ottoman Sultans were Sufis of the Mevlevi order. During the later Ottoman period, the dervishes acquired considerable power in the sultan's court. With the secularization of Turkey following World War I, the Mevlevi Brotherhood (and many others) were seen as reactionary and dangerous to the new republic, and were therefore banned in 1925. While their properties were confiscated, members of the Mevlevi Brotherhood continued their religious practices in secret until their ecstatic dance were again allowed in 1953. 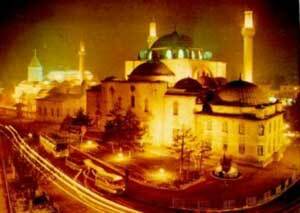 The former monastery of the whirling dervishes of Konya was converted into a museum in 1927. While the dervishes have been banned from using this facility, it functions as both museum and shrine. In its main room (Mevlana Turbesi) may be seen the tomb of Mevlana covered with a large velvet cloth embroidered in gold. Adjacent to Rumi's burial is that of his father, Baha al-Din Valed, whose sarcophagus stands upright, for legends tell that when Rumi was buried, his father's tomb "rose and bowed in reverence." The tombs of Rumi's son and other Sufi sheikhs are clustered about the shrine. 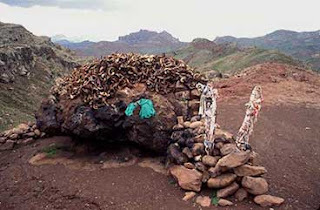 The burials of Rumi, his father and several others are capped with huge turbans, these being symbolic of the spiritual authority of Sufi teachers. The Mevlana Turbesi dates from Seljuk times while the adjoining mosque and the rooms surrounding the shrine were added by Ottoman sultans. Formerly used as quarters for the dervishes, these rooms are now furnished as they would have been during the time of Rumi, with mannequins dressed in period costumes. Within one room there is a casket containing a hair from the beard of Muhammad. Each year on December 17th a religious celebration is held at the site of Rumi's tomb, to which tens of thousands of pilgrims come. In the shrine there is a silver plated step on which the followers of Mevlana rub their foreheads and place kisses. This area is usually cordoned off but is opened for these devotional actions during the December pilgrimage festivities. In addition to the shrine of Rumi, pilgrims to Konya will visit the shrine of Hazrat Shemsuddin of Tabriz (traditionally visited before the shrine of Rumi), the shrine of Sadreduddin Konevi (a disciple of Hazrat ibn Arabi and a contemporary of Mevlana), the shrine of Yusuf Atesh-Baz Veli, and the shrine of Tavus Baba (who may in fact have been a women and therefore Tavus Ana). Within the museum of Rumi there is a map that shows the location of these various holy sites. Lineage: Sayyidinah Abu Bakr (R.A) on the father side and Sayyidinah Ali (R.A) on the mother's side. Date of Birth: 6th Rabiul Awwal 604 A.H.
Father's name: Muhammad Baha'uddeen Veled. His father was given the title of Sultãnul-Ulamã (King of Scholars) as a result of solving difficult problems pertaining to law and religion. While in his adolescence he delivered discourses everyday of the week. Early Education: Moulãnã Rumi's (R) father entrusted him to one of his disciples, Saiyid Burhãnuddeen who taught him for 4-5 years later after his father's death. Burhãnuddeen guided him in secrets of Sufism (Mysticism). At the age of 22 Moulãnã Rumi (R) migrated with his father from Balkh to Konya, where his father was a teacher at a college founded by the king. After the father's death Moulãna Rumi (R) occupied the seat of his father. Thereafter he taught at the college and preached to the people. Further Education: In 630 A.H Moulana Rumi (R) went to Syria for further education. He studied at Madrasah Halawiyah which is the Haleb (Aleppo) and received his education from Kãmaluddin-al-Adim. Thereafter he proceeded to Damascus and studied in Madrasah Maqdaysah. Amongst other teachers, he also studied by Shaykh Mohinuddin ibn Arabi and Shaykh Uthmãn Rumi. Either in 634 or 635 Moulãna Rumi (R) returned to Konya and resumed teaching, because of the oppression and destruction by the Mongols. A number of great scholars moved towards Konya to seek the company of Moulãna Rumi (R). He was head of the scholars and he had 400 students under him. "Shams Tabez was it, who led me to the path of reality, for the earth I have is simply his bounty." Departure of Shams Tabrez: Moulãna Rumi (R) had given up teaching and delivering lectures due to his learning from his spiritual mentor Shams Tabrez. This was intensely resented by his followers, disciples and friends. Shams Tabrez, realising that the blame was being put on him, discreetly left Konya, on the 21st Shawwãl 643 A.H, after a stay of about 16 months. Moulãna Rumi (R) now promoted Shaykh Salãhuddin as his confident and chief assistance. After the death of Salãhuddin, Chelebi Hishãmuddin Turk as his spiritual vicegerent, who was his successor for 11 years. Whenever he went out, a large number of students, theologians and even nobles accompanied him on foot. The Kings and chiefs of state received him with the highest honour, he continued to teach and give juristic opinions. He was of simple and frugal habits. He never had a pillow nor a bedding nor did he ever lie down for taking a rest. Whenever he felt drowsy, he took a nap wherever he was sitting. Whenever presents where he received he often passed it on to Salãhuddin or Hishãmuddin. He used to be very pleased when there used to be no provisions in his own house. Whenever time of Salãt came Moulãna Rumi (R) was a completely change man, his face turning pale would soon be lost in Salãt. It is related that it was often that Moulãna Rumi (R) spent the whole night in 2 rakãts of Salãt. Once Moulãna Rumi (R) was performing Salãt in cold, bitter night winter, when his tears trickled down his face onto his beard, turning into ice due to the intense cold, withstanding this he remained occupied in Salãt unaware of this. No beggar was turned away without being given something, he never buttoned his gown or shirt so that it might be easier for him to take it off, in case anybody asked him for it. "Flow of speech from the heart is a sign of intimate friendship, obstruction of speech arises from lack of intimacy." By Love dregs (residue) become clear; by love pains become healing. By Love the dead is made Living; by love the King is made a slave." "Love is the only melody welcomed by its sufferer, who never desires to recover from it. All the sick hope to be cured, but this sick one sobs, crying "Increase my Sickness"
It is related that Konya was continuously rocked by earthquakes for 40 days before his death. He passed away at the age of 68 years and 3 months, on the 5th of Jamãdiul Ãkhir 672 A.H. It is said that the number of people who flocked to join the funeral procession was so great that bier taken out early morning could reach the burial place by sunset. He was laid to rest next to the Saints of Islam. The shrine of the Sufi saint, Somunca Baba, is located in central Turkey, 80 kilometers northwest of the city of Malatya and 3 kilometers from the small town of Darende. Somunca Baba, also known as Sheikh Hamid-I Wali, was born in the mid 14th century in the village of Akcakaya in Kayseri. When he was a young man he left home to travel to different centers of learning in the Islamic world. Journey from Kayseri, he studied in Damascus, Tabriz and Erdebil. Following his studies in Erdebil, Sheikh Hamid-I Wali went to the city of Bursa where he became a scholar and a baker. He built a bakery next to his hermitage and freely distributed loaves of bread to local people. Because of his sanctity, sanctity and abundant generosity he was given the name Somuncu Baba, meaning 'Father of Loaf'. After some time as the Imam of the Grand Mosque of Bursa, the Sheikh went upon a pilgrimage to Makkah in the company of his son and other disciples. 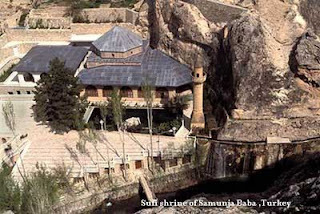 Following his pilgrimage to Makkah, Somunca Baba came to the small town of Darende and lived the final years of his life near a sacred pool at the foot of high cliffs along the Tohma River. Disciples visited the saint at his simple cell and upon his death in 1412, the site became a pilgrimage shrine. In 1685, the shrine was incorporated into a religious complex of mosque and tombs. The sacred spring, which emanates from a hidden source in the cliff walls and ends at a small pool at the base of the minaret, has a constant temperature of 16 degrees centigrade and is filled with enormous orange fish. Inside the shrine is a reliquary with two hairs of the Prophet Muhammad and the tombs of Somunca Baba and his son HalilTaybi. Duzgun Baba. :Thirty kilometers east of the town of Tunceli in east central Turkey stands the holy mountain of Duzgun baba. According to local legends the mountain was a sacred place of the Hurrian/Hittite storm god Teshub long before the arrival of Islam. Upon the peak is a cave where lived a Sufi saint, by the name of Duzgun baba, in the late 13th century. Folklore of the holy place refers to its healing powers and barren women especially favor both the mountain and cave. Pilgrims will spend the night in the cave, hoping that Duzgunbaba will appear to them in dreams. The Gerat Master Ahmed Ziyaeddin Gumushkanewi initially used his small room in the Mahmud Pasha Madrasa in Istanbul for instruction and guidance. Later, the room became too small for the increasing number of the desciples. With the efforts of Hasan Hilmi Kastamoni, he established a tekke at the Fatma Sultan Mosque. Later on this mosque became known as the "Gumushkhaneli Dargah." The Dargah became a school for studying the traditions of the Prophet Muhammed (pbuh). Important personages attended the Hadith Lectures in the tekke. After the tekkes were closed by the government in 1925, the mosque was kept open to serve the Muslims until 1945. Despite the fact that it was declared as a historical work, the mosque was demolished in 1957 with a lame excuse of "widening the road nearby." Although the tekkes were officially closed, the instruction and the guidance of the order continued. First, the Damad Ibrahim Pasha Mosque with Shaikh Hasib Effendi, then the Ummu Gulsum mosque with Shaikh Abdul'aziz Effendi became the center of the Gumushkhanawi Dargah. In 1958, then presiding Shaikh Muhammad Zahid Burusawi moved to Iskenderpasha Mosque in the same neighborhood. Since then, Iskenderpasha has been the Dargah of the order. The late Shaikh Mahmud Es'ad Cosan spent a great deal of time abroad -- from Australia to Europe and America-- providing spiritual guidance to the masses as well as to the novices and the advanced in the sufi order. He passed away on February 4, 2001 in a traffic accident in Australia--May Almighty Allah bless his soul. You will find some links to the works by Shaikh Mahmud Es'ad Cosan on this page. Please keep in mind that this page is not an official page of the Gumushkhanewi Dargah, Shaikh Muharram Nureddin Cosan or Shaikh Mahmud Es'ad Cosan. Hazrat Shams-e-Tabrizi(raz) ad. 1248 was an Iranian Sufi mystic born in the city of Tabriz in Iranian Azerbaijan. He is responsible for initiating Mawlana Jalal ad-Din Muhammad Rumi(rah), usually known as Rumi in the West, into Islamic mysticism, and is immortalized by Rumi's poetry collection Diwan-e Shams-e Tabriz-i ("The Works of Shams of Tabriz")(raz). Hazrat Shams-e-Tabrizi(raz) lived together with Rumi in Koyna in present-day Turkey, for several years, and is also known to have travelled to Damascus in present-day Syria. After several years with Rumi, Hazrat Shams-e-Tabrizi(raz) vanished from the pages of history quite suddenly. It is not known what became of him after his departure from Rumi, and there are several locations that lay claim to his gravesite; one is in a remote region of the Karakorams in Northern Pakistan at a place called Ziarat not far from the village of Shimshall, and another is in the same town that Rumi is buried in: Konya, Turkey. Rumi's love for Hazrat Shams-e-Tabrizi(raz), and his bereavement at his death, found expression in an outpouring of music, dance, and lyric poems. Rumi himself left Konya and went out searching for Hazrat Shams-e-Tabrizi(raz), journeying as far as Damascus before realizing that Hazrat Shams-e-Tabrizi(raz) and himself were, in fact, "one and the same"
Hajji Bektash Wali (Haji Baktaš Wali) Turkish: Haci Bektas Veli was a Persian Islamic mystic, humanist and philosopher from Khorasan who lived approximately from 1209-1271 in Anatolia. The name attributed to him can be translated as "The Pilgrim Saint Bektash." He is the eponym of the Bektashi Sufi order and is considered as one of the principal teachers of Alevism. He is also a renowned figure in the history and culture of both Ottoman Empire and modern day Turkey. According to Uzun Ferdowsi's Walayatnama (translated as The Saintly Exploits of Haci Bektas Veli), the principal biographical work concerning Hajji Bektash, he was born in the town Neyshabur (Nishapur), which is now a city in the province of Khorasan in northeastern Iran. As analyzed by H. Algar and A. Gölpinarli, it is highly probable that he formed part of the westward migration that was occasioned by the Mongol invasion of Khorasan, and that his origins were therefore Iranian. It is reported in some Bektashi legends that Hajji Bektash was a follower and the caliph ("representative") of Khwaja Ahmad Yasavi, a Sufi mystic from Central Asia who had great influence on the Turkic nomads of the steppes. However, this claim is rejected by modern scholars, since Ahmad Yasavi lived nearly one hundred years before Hajji Bektash. In addition, there are no signs of Yasavi influence in the original teachings of Hajji Bektash. Bektashism spread from Anatolia through the Ottomans primarily into the Balkans, where its leaders (known as dedes or babas) helped convert many to Islam. The Bektashi Sufi order became the official order of the elite Janissary corps after their establishment. The Bektashi Order remained very popular among Albanians, and Bektashi tekkes can be found throughout Macedonia, Kosovo and Albania to this day. During the Ottoman period Bektashi tekkes were set up in Egypt and Iraq, but the order did not take root in these countries. The Bektashi order was most popular among rural segments of Anatolia and in the southern Balkans, in contrast to the Mevlevis, who generally attracted artisans, or the Naqshbandi or Khalwati orders, who attracted theologians and government officials. It was also during the Ottoman period that many Alevi Muslims in Turkey attached themselves to the veneration of Hajji Bektash, a move which may have further polarized the tension between Alevism and the mainstream Sunni ideology of the Ottoman empire. When the Janissary corps were abolished in 1826 by Sultan Mahmud II the Bektashis suffered the same fate. The babas of the tekkes and their dervishes were banished to staunchly Sunni villages and towns, and their tekkes were closed or handed over to Sunni Sufi orders (mostly Naqshbandi; for example, the Goztepe Tekke in Istanbul was given to the Naqshbandis during this period). Although the Bektashi order regained many of its lost tekkes during the Tanzimat period, they, along with all other Sufi orders, were banned in Turkey in 1925 as a result of the country's secularization policies and all Bektashi tekkes were closed once more along with all others. As a result, the headquarters of the order were moved to Tirana in Albania. The main Bektashi tekke is in the town of Hajibektash in Central Anatolia. It is currently open as a museum and his resting place is still visited by both Sunni and Alevi Muslims. Large festivals are held there every August. Also the Göztepe and Shahkulu tekkes in Istanbul are now used as meeting places for Alevis. HAZRAT ABDULLAH SHAH ASHABI, THATTA. Muhammd Tariq. Picture Window theme. Powered by Blogger.